You’ve finished your image and everything looks perfect, right? Not quite? But you’ve got lots of detail, you’ve put tons of thought into the placement of each element, and you’ve got a great concept, so what gives? If you’re not paying attention to the color in your image, you’re missing one of the single most important visual elements at your disposal. 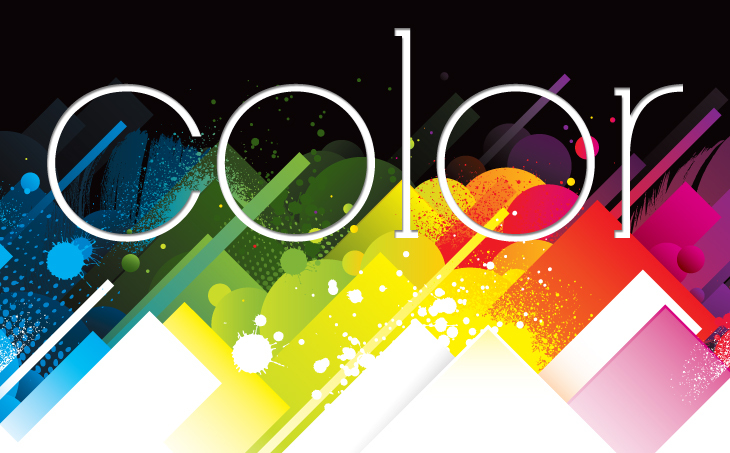 Color does it all: it draws the eye, inspires emotion and heats up or tones down a mood. Color creates drama, depth, and volume. Don’t underestimate the power of color in your work and challenge yourself to use it in different ways. Be bold and choose your hues, organize your tints and take control of your palette. Different surfaces reflect or absorb different parts of the visible light spectrum. Your eye, the little marvel that it is, sorts the light out and gives you the color. “What is red?” is a deep question best left to philosophy students and stoners. But it’s important to understand that every color evokes a different mood, feeling and reaction in people, and if we can control the color in an image we can influence how people react to it. Keep in mind that we’re not always viewing the same reflection and absorption of light waves 24/7. For example, a bright red wall when viewed in broad daylight will likely appear, well, bright red. But the same red wall when viewed in the evening will be a very different shade; it will appear much darker in color. Yellow lighting will make the wall appear orangey-red. For photographers, the fickle relationship between color and light is one of the best things going. It means that not only can you control the color of the elements in your image, but you can manipulate the temperature and tones as well. From playing with transparent light gels and colored reflectors to the white balance settings you choose and time of day you shoot outdoors, you can learn to micro-manage color for precise chromatic control. And that’s just talking in-camera. When the time comes for post-processing, you’re into a whole other realm of sliders, graphs and RGB values. Illustrators have even finer control — they get colors at the touch of a button. There are millions of shades built into the brain of the computer sitting in front of you and all you have to do is pick the ones that work best. The key is to know the effect you’re after ahead of time. Think about color right from the planning stage. Visualize the mood and tone you want and the palette that goes along with it. How is the interaction between colors going to enhance your composition? How much needs to be arranged before the shoot and how much can you do later with software? Illustrators, is the default palette going to cut it or do you need to select a specific color range to work with? And how do colors interact with each other anyway? We’re all familiar with this happy little diagram, right? For those who don’t remember, there are three primary colors: red, yellow and blue. You can take any combination of these colors and create ‘secondary colors’: green, orange and purple. Combining red and blue will create purple, and mixing yellow and red together will create orange. By varying the amounts of each primary color you’re combining, you can create reddish purples, deep indigos, bright teals and yellowy lime greens. Pick up a couple of tubes of paint in the primary colors and see how many color combinations you can come up with. Arrange, blend and compare side by side to get an idea of how they relate to each other. Even better, if you’re in the mood for experimenting, play with the lights to really get a feel for the right color mix. Spectral colors interact differently than pigments, so combining lights will make for different outcomes than mixing paint. Transparent gels, colored lens filters, tinted novelty lightbulbs — try them all out and see how the colors change. There are a few different ways you can combine colors. What we’ll need to illustrate our examples is the classic color wheel (shown right). If you look at the wheel, you’ll see it’s divided into three sections by each of the primary colors: red, blue and yellow. The colors that appear between each color are the colors that can be created by mixing the primary colors, creating the aforementioned secondary colors. Between red and yellow you’ll see orange, and on either side of orange the orange will appear yellower or redder, depending on which primary color you’re traveling towards. These colors can be combined in any number of ways, but there are a few particular combinations we’d like to draw your attention to. Colors can be modified through the use of what artsy types refer to as shading and tinting. The unshaded, untinted color is called the hue. Shades are created by starting with a single color, and then adding varying degrees of black. Tints are altered by taking a single color and adding white to create lighter colors. For example, pink and red are essentially the same color, but the pink has been ‘tinted’ to create a different look, and rust is simply a shaded version of red. A composition containing a single color that’s been tinted or shaded is known as ‘monochromatic’. Monochromatic color combinations can be used with dramatic results: don’t ever feel you’re limited when working with a monochromatic color palette. The trick is to use the opposite ends of the color swatches you’re working with to give maximum depth and volume to an image. If you take the color steps between any two primary colors, you have what are called ‘analogous’ colors. These colors share much of the same base colors. For instance, between red and yellow you get red, orange and yellow of varying shades. might think, ‘well, that’s a limiting color palette,’ but analogous colors appear often in nature and for that reason are pleasing to the eye, and they can be used together in surprisingly dramatic ways. Take the examples above: there aren’t a wide variety of colors being employed, but they work together in a way that creates very believable and realistic images. 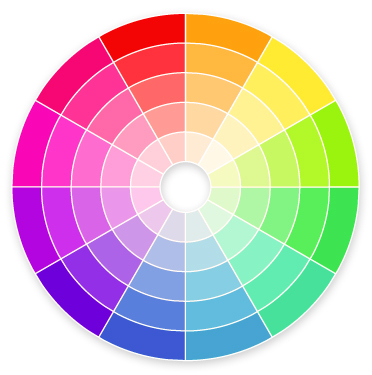 Like analogous color, we base ‘complementary’ colors on our handy-dandy color wheel. Pick any color on the wheel, and then pick the color directly opposite. The combination you’ve just created is what’s known as a complementary combination. Orange birds love blue skies, green trees crave red lights and purple lips are best with golden yellow hair. For whatever reason, they just look good together. Actually, we know the reason. It’s something to do with direct opposites in the color spectrum creating the maximum contrast. If you really want to draw attention to any part of an image, pair it with a complimentary color to make it pop. Placing a single color into different color schemes can create unusual effects. Check out how different the same color behaves when set with different partners. When paired with hot autumn colors and rich light, the toffees in the first image look sweet and warm – everything that the gloves in the second image aren’t. The cool tones, sterile light and especially the context of the image make mint into medicinal without altering any of the RGB values. In the last image, the dress jumps off the page when dropped into the monochromatic pink scheme. In each image, the same color is the highest point of contrast, but for a different reason each time. When creating a very dense composition with lots of elements stuffed into a single image, it’s easy to let color overwhelm the viewer. The trick is not to use as many bright colors as possible, but to use color to draw the viewer’s eye to the key element in your composition. One easy way to do this is by mixing different color combinations in your foreground and background. Try using ‘cooler’ colors in the background of your image, and making the focal points ‘warmer’ colors. The eye will automatically be drawn to the warmer, brighter bits in your image. You can also reverse this combo by using warmer colors juxtaposed by a cooler shade up front. You can also use similar colors to draw a viewer’s attention through the composition. For example, let’s take a composition and make the foreground a warm color and the background a cool color. By using the warm color in unexpected areas of the background, we can make the viewer’s eye travel from the background object to the foreground to convey a feeling movement. Even the tiniest color change can add dynamism to an image. If the background of your image is very detailed, it’s often a good idea to tone it down by using tints and shades of a color, as opposed to lots of different colors. When you squint at an image with a monochromatic background, the foreground elements pop out more, as in the three examples above. You can see how by adjusting the colors slightly, the compositional impact changes completely. In the ‘realistic’ version of our slumber party image here, all of the different colors fight with the gals primping before bedtime and draw the viewer’s eye away from the important bits. You don’t know where to look first. In the ‘blue’ version, we’ve used a monochromatic background in order to force the viewer’s attention to the girls, but the blue color gives a different feel than what we were looking for. The pink was what we chose in the end because it had the right amount of ‘girlie’ feeling to it, which brings us to our next point: how colors make us feel. Blue is very soothing and can have a calming effect. The color brings to mind tranquility, wide open skies and peace. But blue can also be used to convey feelings of coldness and sterility depending on where and when you use it. Yellow often gets the short stick when it comes to the color world, getting stuck with jaundice and cowardice. But a warm, golden yellow also brings us sunshine and joy, and in Asia it’s an imperial color. Orange is a very bold color and often signifies vitality and energy. It’s also used a lot during Halloween and on attention-grabbing road construction signage, and keeps duck hunters all over the world from shooting each other. If you want attention, orange is a good way to attract it. Green means spring and brings to mind feelings of renewal, fertility and rebirth. Green also has significance in many religions; it’s the color of Islam and has lots to say at Christmas (not to mention St Patrick’s day.) Green is also the color of money and features in the phrase ‘green with envy’. Purple is a color that has a long history with royalty and riches, due to its former rarity and expense as a clothing dye. There’s something very exotic about the color purple and it’s use is sometimes associated with mystical and spiritual concepts. Red is probably the most noticeable of colors. When you think of red, you think of passion, love, anger and blood. Red is the color of Valentine’s Day and is a popular color choice for sports cars. We also associate red with signs like ‘exit’ and ‘stop’. Black and white, while not technically considered colors, can also inspire strong feelings. White brings to mind images of purity and cleanliness. In many parts of the world the color white is worn by brides at weddings, but in other areas such as Japan the color white is worn at funerals. Black is equally as dramatic: it can symbolize fear and evil, as well as power, and is considered unlucky when worn by cats. Think about color during every step of your image. Look at what your models are wearing and imagine how the colors can play off each other. Pick your backgrounds for their color schemes. During post-processing, play with the color values and channel mixer in your layer adjustments to change how the elements interact. Illustrators, watch what happens when colors are put side by side, and how the eye responds to different pairings, mixes and contrasts. Don’t settle for colors just as they are — bring them to life and put them to work.